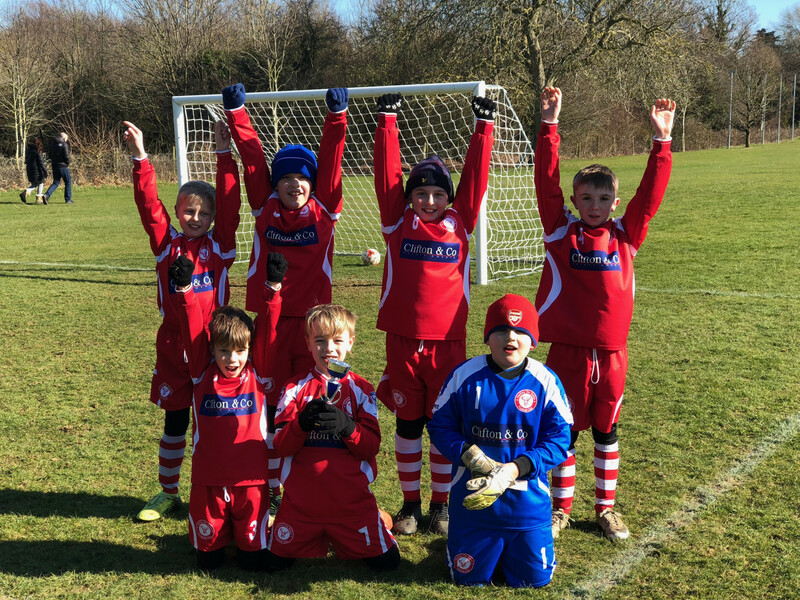 The new U10’s Hartley De Sales Colts team was recently formed by Manager Simon in October 2017 and only joined the Maidstone Primary league in January of this year. 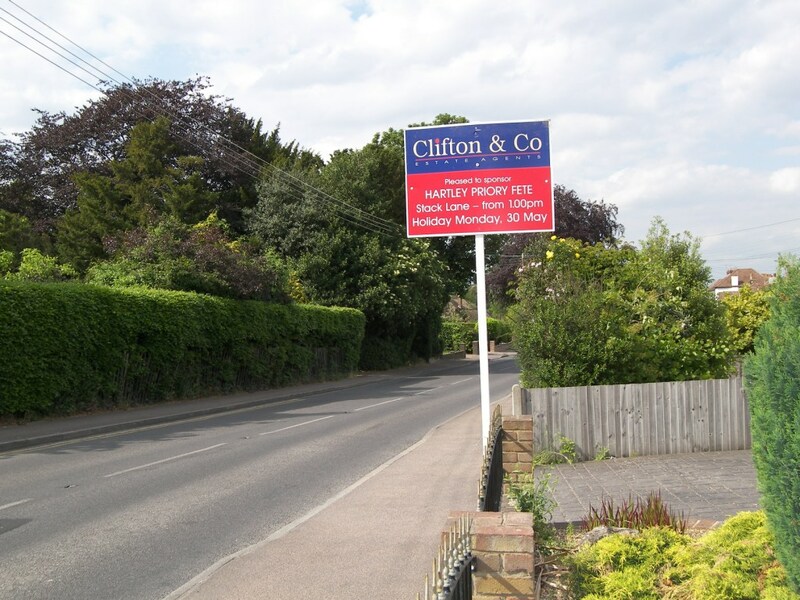 With kits supplied by Clifton & Co, the team is formed of locals boys from Hartley, Meopham and Istead Rise. These ‘Go Getters’ are going to be a force to be reckoned with and will no doubt go from strength to strength over the coming months. Training at both Manor Field (Hartley) and 3G facilities at Corinthians Sports Club (Fawkham), they would always welcome new players, so go along or get in touch. 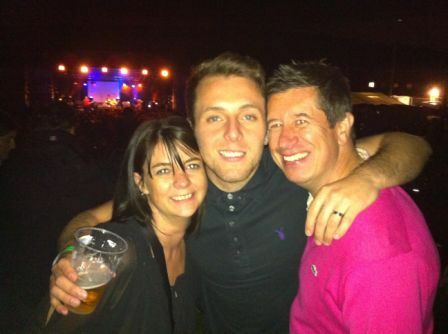 B Festival is a big happy family event with friends and friends of friends and this year was no different. 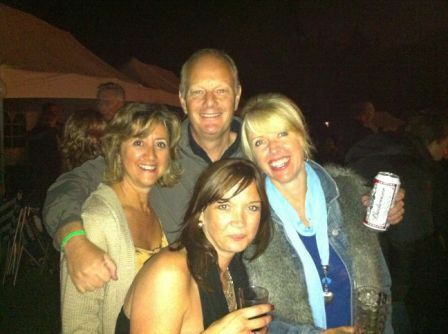 But as well as us all having a fantastic time and enjoying some great music and dancing...and beer....and wine! There is a serious side too. In the twelve years that we have supported B’festival, they have amazingly raised over £145,000 for their chosen charities. As always, they support great charities from Cystic Fibrosis, Help For Heroes, Clic Sargent and more recently Orchid! Along with many other great causes along the way. On consultation with Epic, this year’s charity is an award-winning education charity that exists to increase the number of pupils from under-represented backgrounds progressing to highly-selective universities. 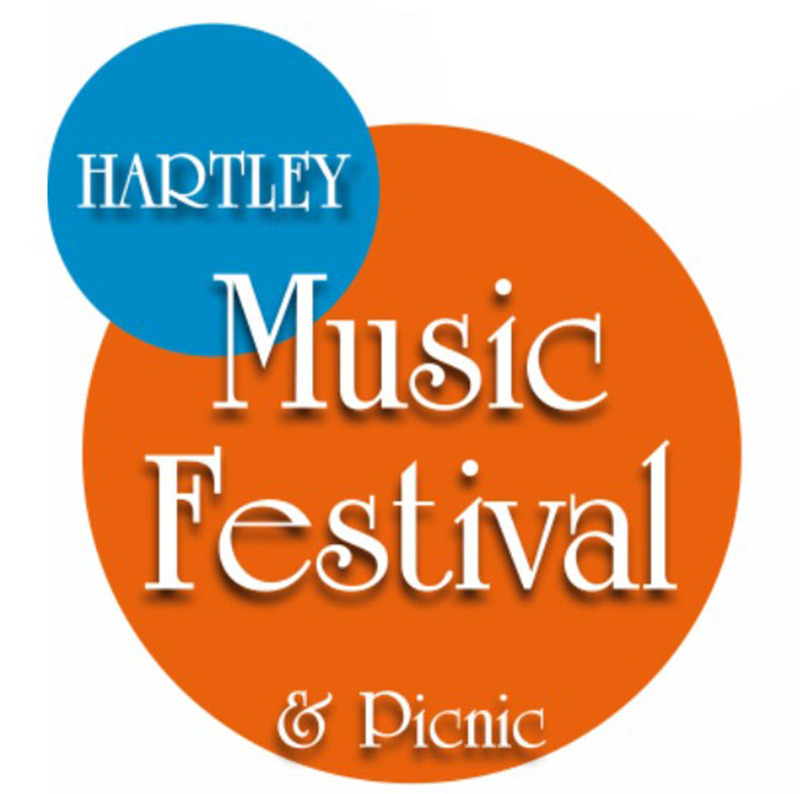 The Annual Hartley Music Festival & Picnic which took place at Manor Field at the end of June attracted a good number of picnickers, considering the clash of dates with other events that day and the day before. The weather held up and the music was provided by the Mike Richards Firebird Band, the Mardi Gras Jazz Band, various soloists and the always impressive Hartley Community Choir, Local Vocals. 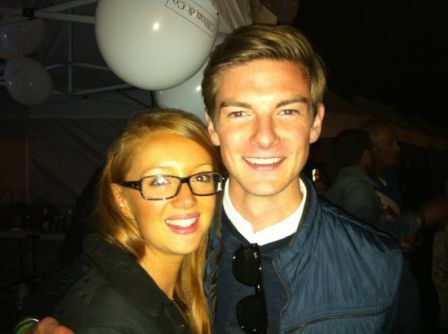 The event is held in aid of the local hospice, ellenor.x. Hospice supporter, actor Jamie Foreman attended, and the former Eastender conducted the auction which, together with the monies raised from the various stalls manned by the willing volunteers, meant over £5,500 was made on the day. 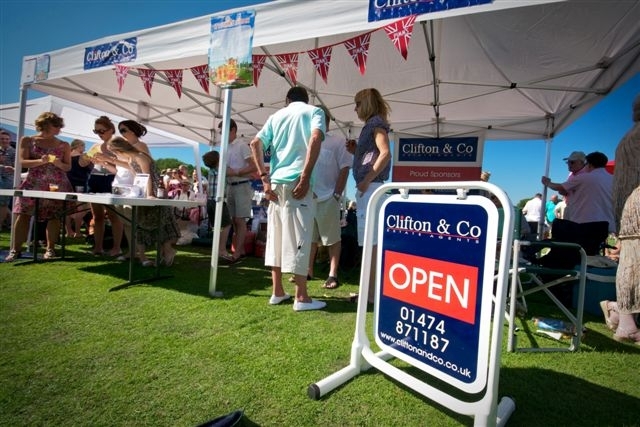 The principal sponsors of this event (formerly known as the Jazz Picnic) are Clifton & Co the estate agents and the outgoing committee thank them and all those who advertised in the programme, gave their time and on the day and beforehand for all efforts in making the day so successful. Many thanks for Cliftons’ support. Our Box Office Manager says that the advertising boards resulted in quite a few ticket sales. 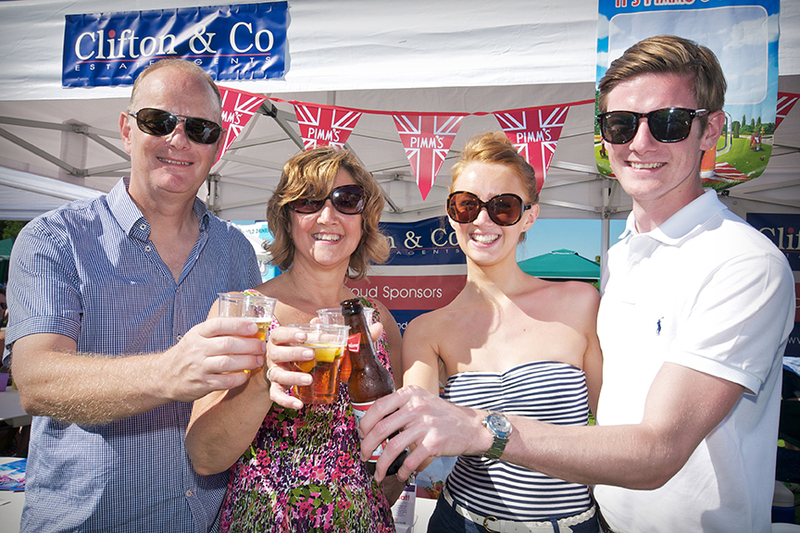 We have been bowled over by yet another tremendously successful BFestival held back in July. For the fourth time Clifton & Co sponsored their annual 'Balloon Race' at Cobham Primary School to celebrate The Queen's 90th Birthday Celebrations! The sun came out to make a marvellous sight with a blaze of red, white and blue balloons across the sky. 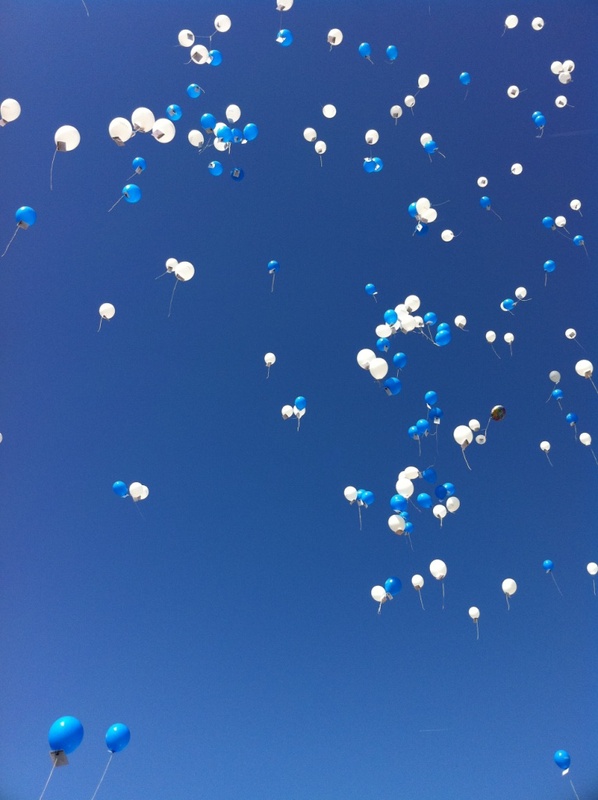 Around 650 balloons were released by the children. Total of 28 balloon tickets returned, the 28 balloons traversed 1023 miles! 6 landed in Kent, 21 in Essex and 1 in Suffolk. Cobham Primary School kindly informed us they received a lovely letter and picture from a dog named Caspar, who found a balloon in his garden aswell as 2 local people who found them in their back gardens. 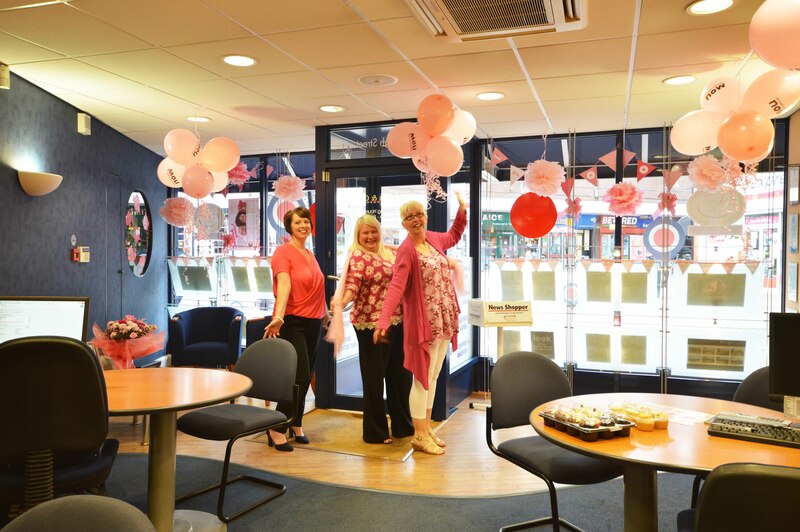 On Friday the 23rd of October, Clifton & Co were delighted to join the rest of the nation in the pinkest event of the year and help raise essential funds for Breast Cancer Now. We are pleased to announce that Clifton & Co will be donating £160 to this tremendous charity, even this seemingly small amount will contribute greatly to promoting awareness to thousands of woman about the signs and symptoms of breast cancer as well as essential research needed to prevent or cure this appalling disease that touches so many people in our lives. Please give yourselves a huge pat on the back and put 9th July 2016 securely in your diary. Saturday 4 July 2015 - Calling all BFesters!!! 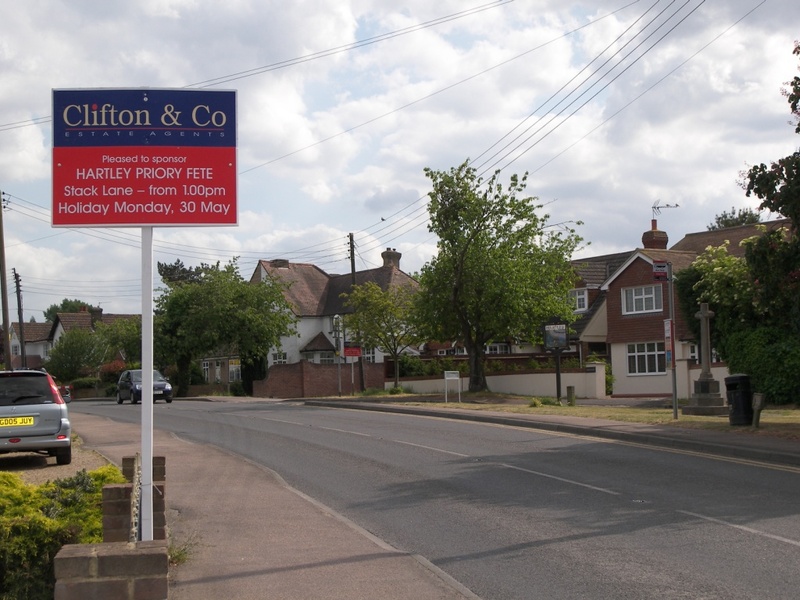 For the third time Clifton & Co sponsored 'Balloon Race' at Cobham Primary School and to celebrate St George's Day in 2015, again another beautiful Spring sunny day! Around Clifton & Co 650 balloons were released by the children all dressed in St George's Day colours....the balloons travelled a toral of 852 miles to Kent & Europe! The furthest reached 149 miles in The Netherlands! On Wednesday 1st April, Maypole School Parents Association (MSPA) held their Annual Balloon Race sponsored by Clifton & Co Estate Agents for the 5th year running. The MSPA Committee, along with willing parent volunteers inflated 1,977 Clifton & Co balloons in the morning, then proceeded to put them in a release net. Pupils at the school were given two balloons to release and parents were invited into the playground to watch the release at 2pm. One month later, the MSPA have received 64 tickets from the UK, France, with 12 tickets reaching as far as Switzerland. The winning ticket number 1349, travelled to Zwischeniluh over 471 miles from the school, with the next two tickets reaching Gwatt & Weissenburg in Switzerland. It’s an annual event in the school calendar that all the children look forward to and is enjoyed by staff, children and parents alike. A total of £1,584.26 was raised for the school and will help fence an area around the schools recently installed Trim Trail and Tyre Park. “A quick but MASSIVE thank you to all the 2014 Committee for your wonderful effort in making yesterday’s event one of the best ever. Despite the weather taking a turn for the worse at around 4pm it was clearly enjoyed by our audience with brilliant performances from both bands and the Local Vocals. Dear Sacha, I would like to thank you very much for runnign the 'Bash a Rat' stall at Fawkham & Hartley Church Fete with such enthusiasm. Having help to run a range of stalls makes a huge difference to the running of the Fete and a better experience for our visitors. We were fortunate with the weather this year, which gave us good attendance at the Fete and a fantastic profit of around £6,500. Once again, many thanks for your support and I hope that you might be happy to participate in the Fete again next year. Yours sincerely FK. What a spectacular beautiful Spring day! 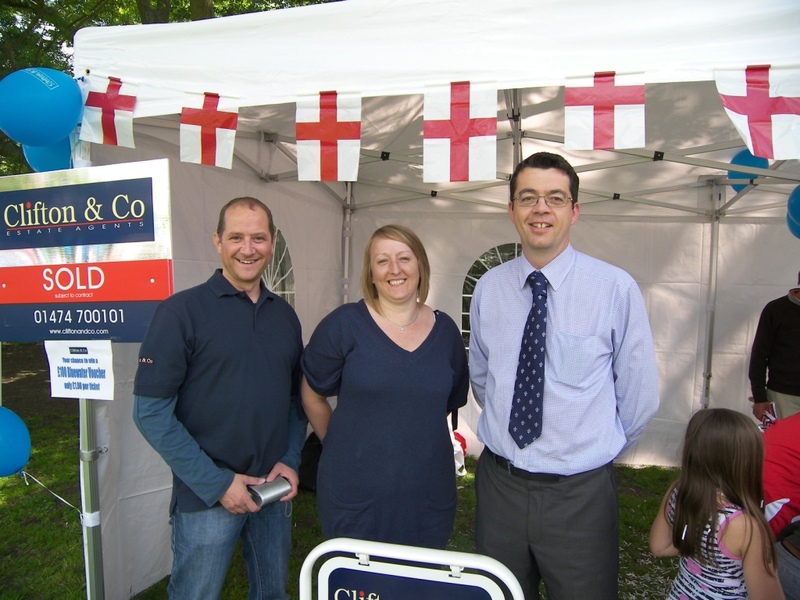 For the second time Clifton & Co sponsored 'Balloon Race' at Cobham Primary School and to celebrate St George's Day in 2014. 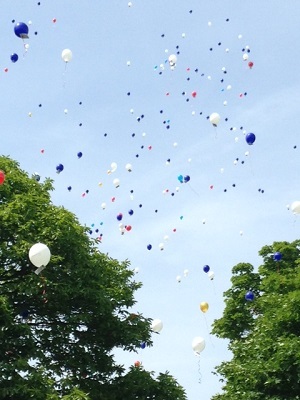 Over 600 balloons were released by the children all dressed in St George's Day colours....16 balloons arrrived back. All from within the UK, but in different counties! These counties included Lincolnshire (2), Norfolk (6), Essex (2), Suffolk (5) and Yorkshire (1). The balloons travelled a total of 1772 miles to counties in the UK! 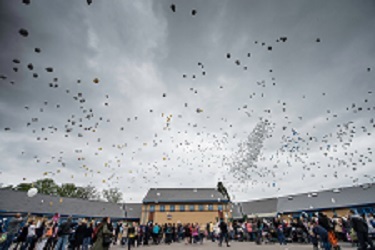 On the Friday the 4th of April before the Easter Break, the whole of Maypole school Dartford, congregated in the school playground along with many parents to release over 1,700 white balloons, branded with the Clifton & Co logo. All 1,700 balloons were bought by parents, friends and family at a cost of £1.00 a balloon to take part in our Annual Balloon Race. 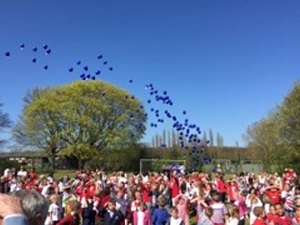 Every child in the school got to release a balloon, which floated high into the Kent sky, but where will they drift off to over the next month? In the past few years we have seen balloons travel as far as Montpeiller in France, St Thomas in Austria, Trzcianka in Poland last year the furthest balloon landed in Haushrunn in Austria over 763 miles away from the school. Once again Sponsored by Clifton & Co who supply the school with balloons and some of the helium, which of course means more money is raised for the school. 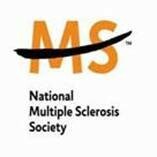 The Maypole MSPA are pleased to announce that they raised a fantastic £1,055.35. A huge thanks to everyone who bought a balloon and supported the school. The Christmas Fayre went well on Sunday and we are waiting for our treasurer to count the money to see how much we made. 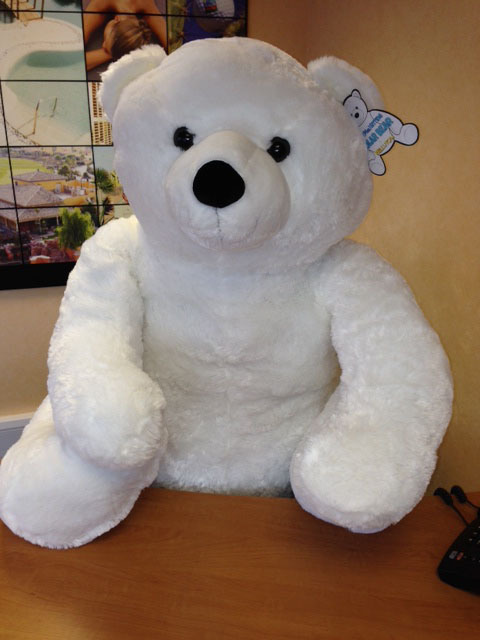 Below is a photograph of the polar bear won by a lucky pupil from year 6 of Our Lady of Hartley RC Primary School who won in a special raffle we had just for the bear. Initially we were going to have it in the teddy bear tombola; but we put it in its own raffle as it was so nice and raised more money that way. Saturday 6 July 2013 - “Calling All BFesters! Another great evening enjoyed by all but more importantly a whopping £16,100 raised for The Brain Tumour Charity! A truly magnificent amount I’m sure you will agree and our thanks and appreciation go out to all concerned in helping to make the evening such a memorable one. Regards to all and keep rocking!! What perfect timing for the first Clifton & Co sponsored 'Balloon Race' at Cobham Primary School and to celebrate St George's Day. It was a spectacular sight seeing over 400 balloons released by the children....the only question now is how far will they go and who will win the first prize? Sponsorship raised £416.00, the balloons travelled a total of 4636 miles to countries in Europe, France 11, Belguim 4, Luxembourg 2, and Germany 1, 1st place travelled to Vitry-les-Cluny, France 502 miles (WINNER! ), 2nd place Schlangenbad, Germany 446 miles, 3rd place Haute-Saone, France 442 miles. All the members of the Hartley Arthritis Research UK fund raising committee including Clifton & Co would like to thank all those who turned up to Manor Field for the annual Jazz Picnic on an unseasonably cold June Sunday. The music was great as usual and enhanced this year by the singing presence of the community choir ‘Local Vocals’. 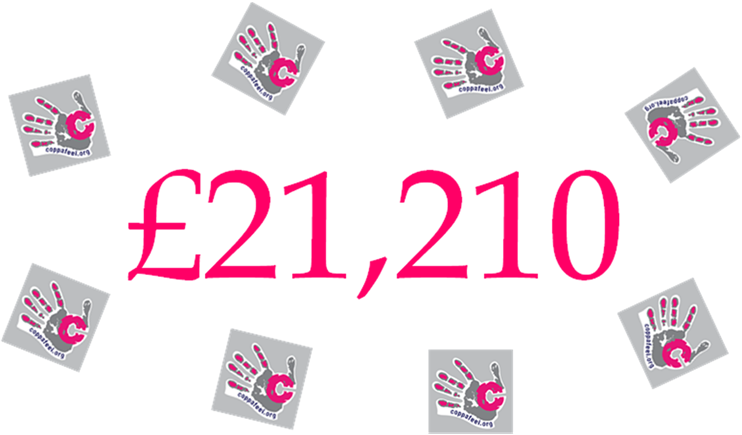 £6,300 was raised to add to over £80,000 the Hartley committee has already raised over the last 13 years. 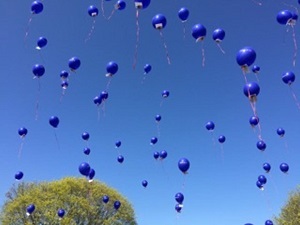 On Thursday 28th March a total of 1,554 Clifton & Co branded balloons were released travelling across five countries inc the UK, France, Germany, Poland and Austria. The winning balloon travelled 763 miles to Hausbrumm in Austria in 2nd Place 697 miles to Trzcianka, Poland and a close 3rd 647 miles to St Thomas, Austira. Well done to Molly Featherstone who sold a staggering 105 balloons which included the furthest travelled and also to Oliver Condon who sold 70. Congratulations to Foals’ previously ‘Piglets’ class who sold the most as a group for the 2nd year running and retained their winning trophy donated by Clifton & Co.
Clifton & Co were proud sponsors or Maypole Primary School’s Annual Balloon Race supplying the branded balloons and helium for the event. The Balloon Race was a wonderful end to the term and although the skies were not as blue as in previous years, this did not dispel the excitement as the children watched over 1500 balloons rising high into the sky, more balloons than ever before! Maypole School Parents Association estimates a profit of over £1000 for the school. We eagerly await the results of where the balloons eventually travel and will publish the winning distances here shortly. 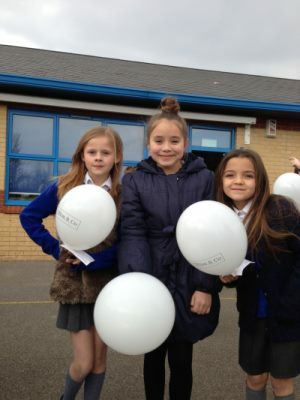 The photograph depicts Sienna Button, Class 4 (Centre) with her two friends eagerly awaiting the release of their balloons. Clifton & Co Estate Agents a member of The Guild of Professional Estate Agents (The Guild), took part in the Zoopla Great British Property Cycle Ride, pedalling from Herne Bay to Hastings in three separate legs on Friday 24th August in aid of Estate Agency Foundation (EAF), a charity dedicated to eliminating the causes of homelessness. 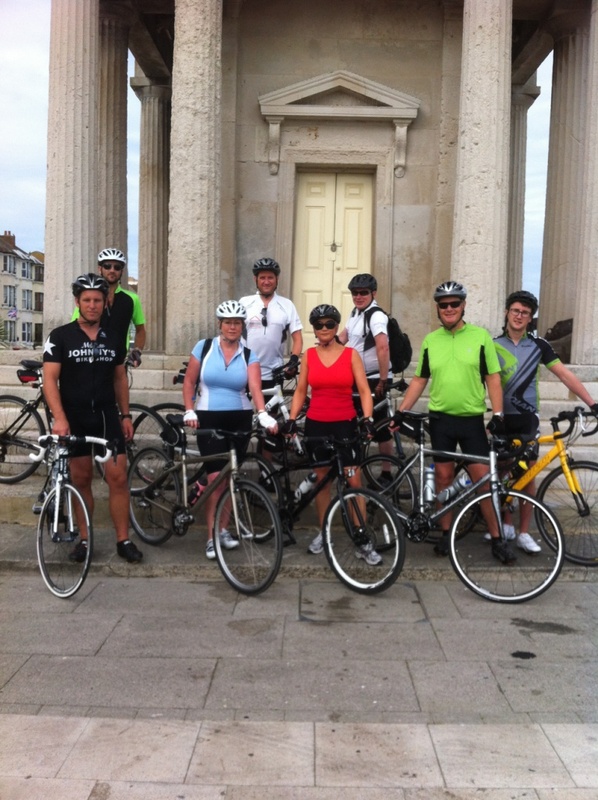 Clifton & Co joined Guild Director Jon Cooke, and Guild member Sean Newman for part of the journey as they took on the ultimate challenge of cycling the entire 3,000 miles of the route around the coast of the UK. The Great British Property Cycle was a 32 stage cycle event, which took place from the 28th July until 29th August covering 3,000 miles in total around the coast. Clifton & Co became an ambassador of the Estate Agency Foundation whereby they helped raise money for the EAF in their area and also encouraged other agents outside of the network to join-in as ambassadors. Guild Director, Jon Cooke, who organised the event, took the ultimate challenge of cycling the full 3,000 miles over 32 stages. The target was to raise £100,000 with the help of those working in the property industry from this testing event. Clifton & Co raised £685.00 it total on this beautiful sunny day at Blackheath Common. WELL DONE TO EVERYONE – to those who raced, to those who supported us and to those who were signed up to race with us, but for one reason or another was unable to, but still continued to raise money for us. We look forward to repeating this next year! 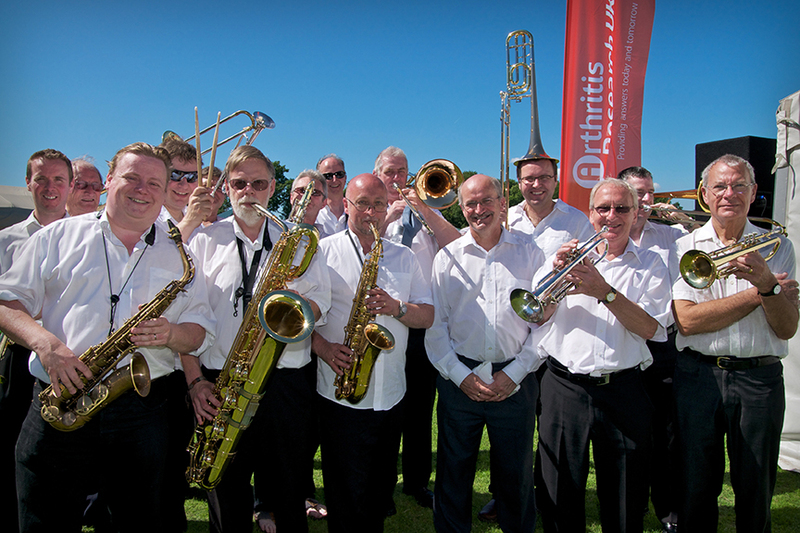 Clifton & Co are proud to sponsor such a successful event and support the worthwhile charity; Arthritis Research UK. 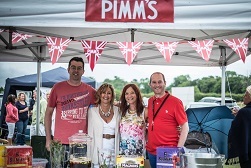 A Quintessentialy an English Summer Garden Party the event has grown year on year since its humble beginnings in 1999 and raised £10,000 at last year’s event alone, attracting people from far and wide. Radio Rhythmakers and Mike Richards Big Band and swing from professional singer Shane Hampsheir. Â There’s lots for the whole family, bring a picnic or sample the Barbecue, Pimms, Teas, Cakes, Ice Cream, etc.Â Alan Dedicoat, voice of the lottery balls, will be there to lend his inimitable presence to the Auction. There are also pony rides, crafts, raffle, plants, massages and bottle stall and new for this year, a splendid display of vintage motorcycles and cars. 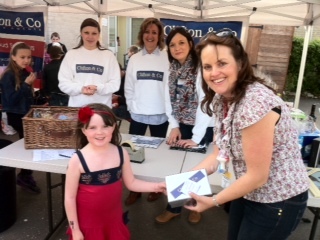 Clifton & Co Hartley were proud to be supporters of the Hartley Primary School Fete on Saturday 12th May. Attended by over 200 people with special appearances from the one and only Batman (Clifton & Co MD, Clifton Button) and for the younger ones; Noddy, a role duly shared by Sacha Dyer Branch Director Hartley and Apprentice Nina Jewiss. Batman and Noddy along with other members of the Clifton & Co team ran the hugely popular Raffle stall for which Clifton & Co donated the star prize of £100 Bluewater voucher. This was won by a lucky young pupil from the school pictured receiving her prize from Mrs Samantha Robinson, Chairwoman of the Parent teacher association. A fantastic day was had by all and to cap it off, the sun even stayed out for the whole event, helping to raise lots of money for the School. On Friday 30th March Clifton & Co sponsored Maypole Primary School’s Annual Balloon race sending hundreds of blue and white Clifton & Co branded balloons into the spring sky. We are now thrilled to report the results of this spectacular event and are proud to say our name has travelled south through Kent, crossing the English Channel and landing all across French provinces. The winning balloon travelled belonging to T King travelled 600 miles to Aix-en-Provence in the South of France. Coming a close second was Mrs C White, her balloon landing in Montpellier at 570 miles. Third place was won by Ava Webb-Birch, a Maypole Year 3 pupil with her balloon coming to rest in Montagnol some 541 miles from the School. 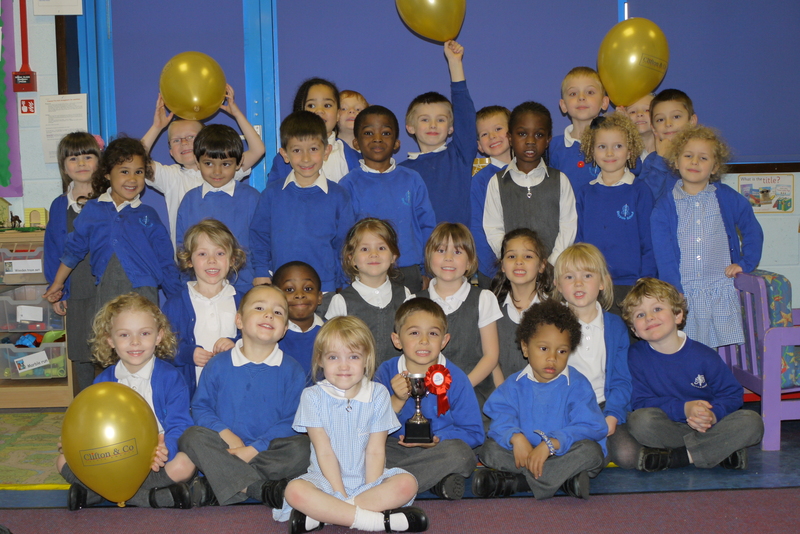 Well done to the class sponsoring the most balloons; Reception class ‘Piglets’ can been seen in the photo below with their winning trophy donated by Clifton & Co! Managing Director, Clifton Button was thrilled by the far-reaching results and as ever was pleased to sponsor such as successful event. Sacha Dyer – Branch Director of our Hartley office has dared to bare all in aid of a local breast cancer charity and is appearing in a 2012 calendar along with 11 other local businesses, the theme being ‘Chaps instead of Baps’. It portrays men at their workplace in a state of undress with the essential parts of course, being covered. 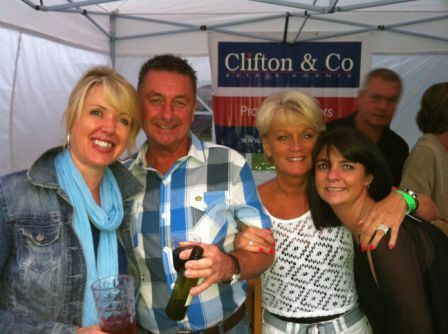 Clifton & Co were one of the sponsors of the B-Festival for the 2nd year running. 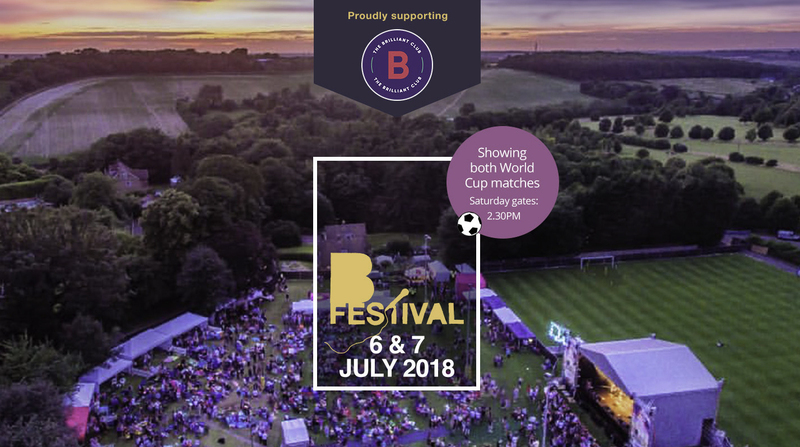 B-Festival is a music festival held in the heart of Kent’s countryside born out of a family garden party which has helped to raise thousands for local and national charities. The event brings together an eclectic line up of talent. 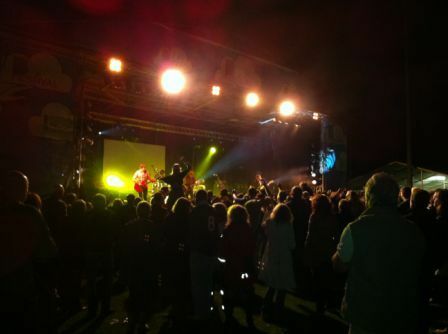 Including multi-million record selling band Toploader, who headlined on Friday 15th July. Previous bands have included the genuine Drifters and Heatwave. The event grows every year and really is a well staged and managed local music festival for all ages, with licensed bar, bbq and hog roast. ‘We are very sorry for not reporting back before now on how the 2011 Festival went, very remiss of me, as you are probably aware we staged our first Friday night concert with young local bands and Toploader as the 'headline' even though the numbers weren't quite what we had hoped for it was a great nigh and opened the concert up to more local people, there was definitely enough encouragement for us to run it again next year so keep your eyes open for the line-up. The Saturday event was huge fun again with all the bands doing a superb job - I know that some of you have spotted 'Kitty' on the X Factor, she was our Lady Gaga - we have got some video clips that I intended to put on Youtube but so far the technology has defeated me.......I'll get one of my children on the case! I am glad to report that the event raised over £10,200 for Help for Heroes, I will be in touch shortly with information on next year. We would like to thank Mr & Mrs C from New Ash Green who were the sucessful bidders for the Sir Ian Botham signed bat & ball at £465. The Auction took place at the Annual Arthritis Research Jazz Picnic which took place on Sunday 26 June 2011 at Manor Fields, Hartley, Kent. 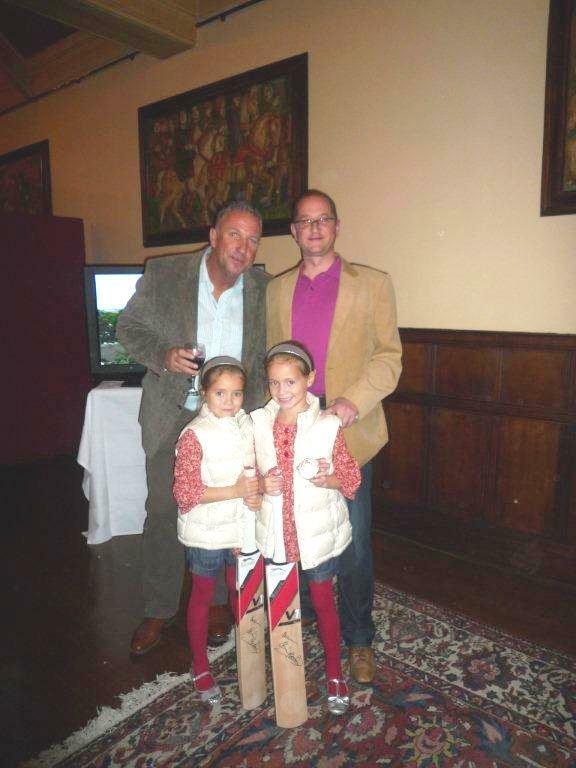 Photo shows Clifton Button, Managing Director - Clifton & Co Estate Agents and his daughters Harley & Sienna collecting the bat & ball from Sir Ian Botham for the Auction. 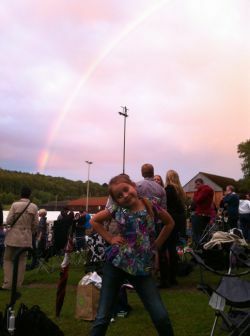 On Sunday, 26th June as temperatures soared into the 30’s hundreds of people gathered on Manor Field, Hartley. After almost two weeks of rain and what looked like low ticket sales the event turned out to be bigger and better than ever. Repeat visitors joined those coming along for the first time, impressed by the whole organisation and enjoying the live music from Mike Richards Big Band, Radio Rythmakers and swing from Shane Hampsheir in the afternoon sun. Alan Dedicoat, Voice of the Lottery Balls, was there to lend his inimitable presence, and chat to the crowd. Laura Hamilton (children’s TV presenter and 2nd in TV’s Dancing on Ice this year) attended with her family and shaved the moustache of Organiser David Brooks, raising £500 in sponsorship. In addition there was a Hog Roast, Pimms, Crafts, Plants, Cakes etc and Pony Rides for the children. 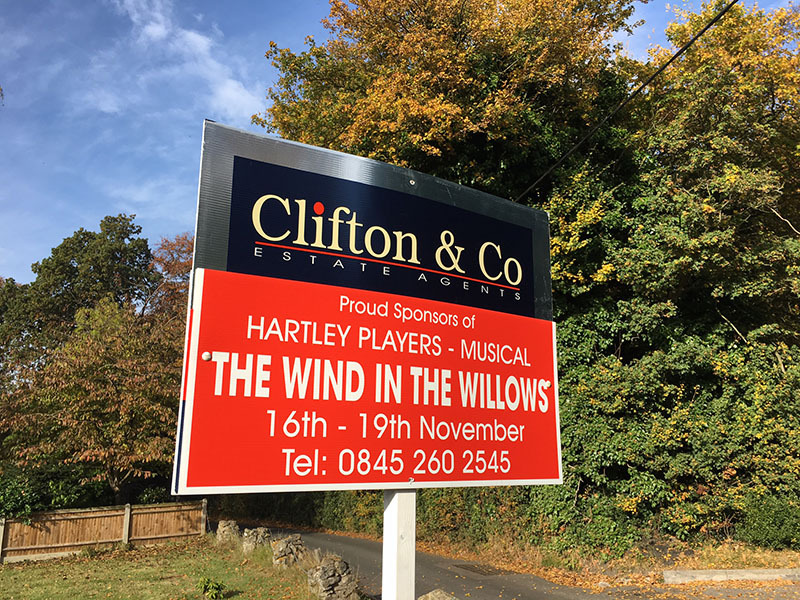 Clifton & Co are proud to be main sponsors of such a successful event and look forward to being involved in the event next year. Following England’s success in the Ashes this year, the legendary Sir Ian Botham, arguably the greatest English cricketer, has kindly signed a bat and ball for Clifton & Co Estate Agents to raise money for Bid for the Bat! Clifton & Co Estate Agents have had the memorabilia mounted in a splendid display case and are inviting bids(opening say £400) by deadline Friday 24 June for this worthy cause. For a closer look at this superb piece of sporting history, please contact our Hartley office for a viewing. Anyone who would like to place a bid should email their bid amount and full contact details to the contact below. 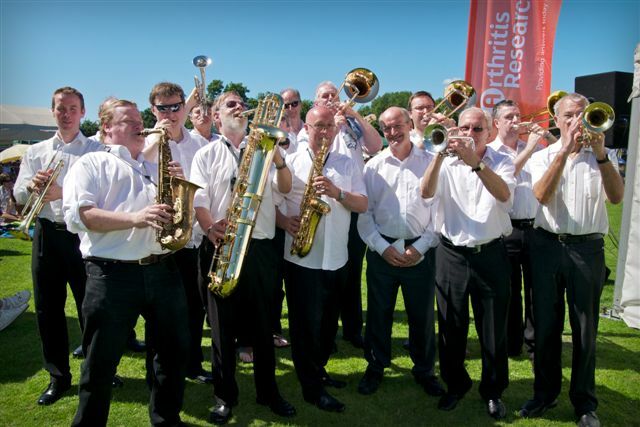 The winner will be announced at the Annual Arthritis Research Jazz Picnic which will be taking place on Sunday 26 June at Manor Field, Hartley, Kent. Tickets for this event are also available prior from Clifton & Co Hartley office and are also sold at entrance on the day. The Clifton & Co name flies Continental! As previously reported on our property page, on Friday 8th April Clifton & Co sponsored Maypole Primary School’s Annual Balloon race sending hundreds of blue and white branded balloons into the spring sky. We are thrilled to report the results of this spectacular event and are pound to say our name has travelled the breadth of Kent and Sussex and has even crossed the Channel, not only landing throughout France but one balloon remarkably reached Italy! Lucky Maypole School pupil, JonJo Heuerman, year 4 was delighted to have the winning balloon which flew 521 miles to the Alpe Devero and Veglia National Park in Italy. JonJo was presented with a congratulatory prize from the School and also a Bluewater voucher from Clifton & Co on his last day at school before they broke for Half-Term. Other runners up included Sarah Stockman’s balloon which reached Bellevaux, France travelling 459 miles, followed closely by Carolyn Dawson whose balloon found its way to Pratz, France some 431 miles. 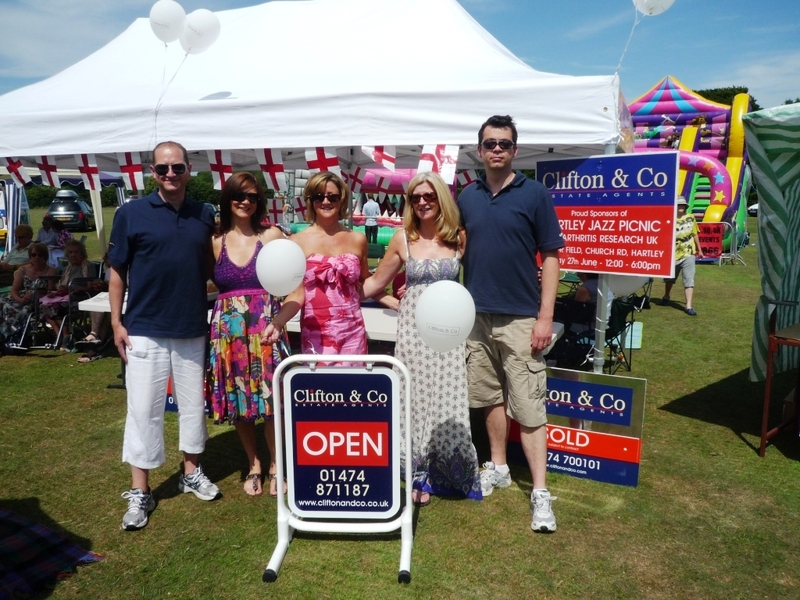 Clifton & Co have been regular sponsors of the Priory Fete, St Francis De Sales. Hartley since opening the office in 2009. 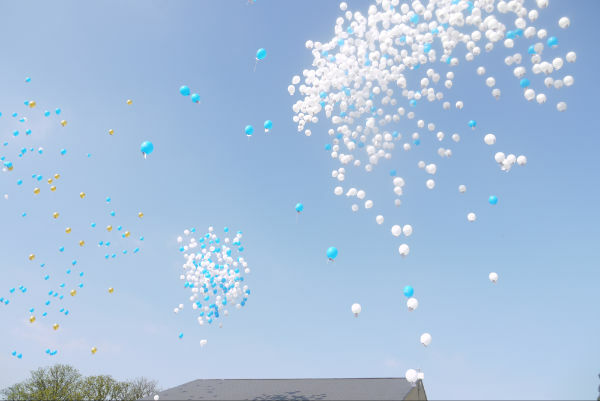 The blue and white Clifton & Co branded balloons were let loose into a beautiful cloud-free sky raising approximately £500 for the school fund. The balloons were tagged and there will be a prize for the one travelling the furthest. Lindsey Ede, Logistics Director said “this is one of many events we are supporting this year and we are always pleased to be involved with the local community”. Having sponsored the jazz picnic on its 10th anniversary and looking forward to attending what a dilemma lay before us when England were drawn against Germany on Sunday the 27 June 2010. However, commitment made we spent a balmy, lazy Sunday afternoon on Manor Field in Hartley amongst a fantastic crowd of people of all ages. 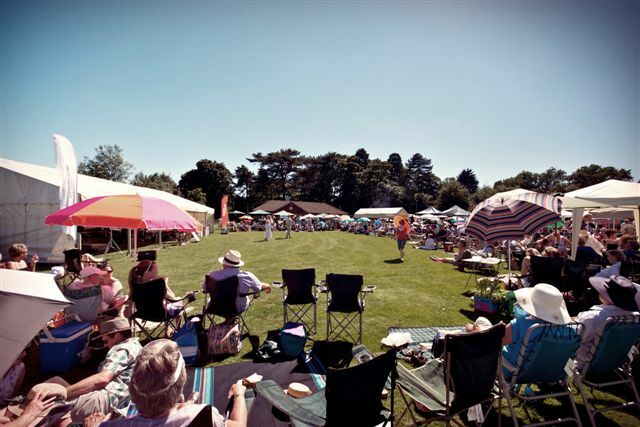 Quintessentially an English summer picnic with a glass of Pimms in hand, there was the added attraction of superb live music from Radio Rhythmakers, Mike Richards Big Band and local crooner Shane Hampshire and not forgetting the children there was a bouncy castle, face painting etc. After hearing the football score the right decision was definitely made, there was more passion coming from the artists and bands on Manor Field than was on the pitch in South Africa. It’s the organizers that make it such a great occasion and we were happy to support such a worthwhile charity ‘Arthritis Research UK’ with advertising boards, balloons and a contribution to the Charity.